As part of our feature in the Spring 2016 edition of this magazine an ‘on line’ competition was run during the month of June offering a £500 voucher towards the cost of installing PlatinumNRG Revival products in your home, to enter, entrants had to visit the Revival section of this site and find the answer to the competition question. As expected, the competition witnessed hundreds of successful entries and the prize winner drawn at random was, Frances Hopkins, from Knaphill, Surrey. 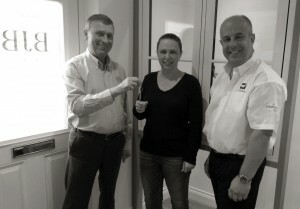 Following discussions with our local Installer Partner, BJB Windows Limited of Normandy, Frances elected to replace her old back door that had not worked properly for years with a brand new PVCu Flush Door. The installation was recently completed and Frances kindly came to BJB’s showroom this week to be officially presented with her keys from Gary Pritchard, Joint Managing Director of BJB and Peter Hand, Director of Sales of PlatinumNRG.